The sit-stand desk was not long ago considered an office novelty but more recently has become a popular feature in many modern workplaces. Known for being a healthier alternative to traditional sedentary desks, the sit-stand desk has many health benefits that can change an office workers lifestyle. Headlines such as “Sitting is the new smoking” have gained employer’s attention and as a result, the popularity and demand for sit- stand desks has grown over the years. Health experts recommend that we spend at least 2 hours per day standing or away from our desks, with the average office worker spending 8-9 hours in the office this can be a difficult task to achieve. The option of using a sit-stand desk while completing a variety of work tasks could certainly help you achieve your recommended amount of exercise. Another key factor is that many companies have now embraced a workplace- wellbeing culture. They include breakout areas, gyms and even exercises classes into their day to day office routines. Greater movement and activity in the office, such as standing up when taking a phone call, have been cited as factors that can help to decrease blood pressure, cholesterol, stress and chronic pain. 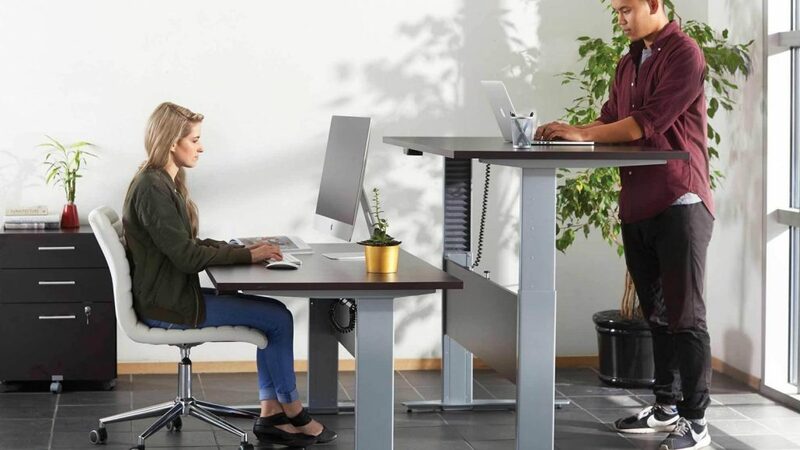 The freedom and flexibility of a sit-stand desk give you the opportunity to do both, standing at your desk is not beneficial for everybody, having the option to return back to seating height is important. In an ever-increasing health-conscious work environment, we all aware of the importance of exercise and looking after our bodies. The Move! 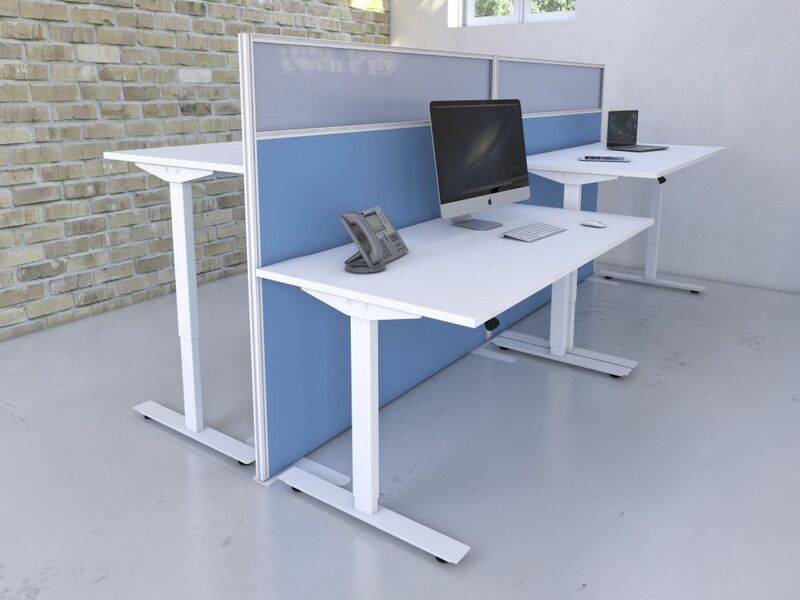 height adjustable desk range addresses the need for companies to promote a healthy, flexible and more productive workplace. We understand that it can take some getting used to standing up when completing your normal office tasks, for some, it may feel too uncomfortable and standing may not be for you. Move! workstations are offered with either square or rounded corners to the work surfaces, with matching end cladding where specified. Various cable management options are available to suit your requirements. Available as a back-to-back configuration or as a freestanding desk, it can be specified with a crank or electric lifting mechanisms, as well as a set-and-forget option. A variety of complementary storage units are included enabling a clean and clutter free office space. Secondly, the Freedom height adjustable desk system incorporates 2 fixed height options and 3 height adjustable actuator options as standard. These optional systems include Fixed, Ratchet, Manual Crank and Electric. 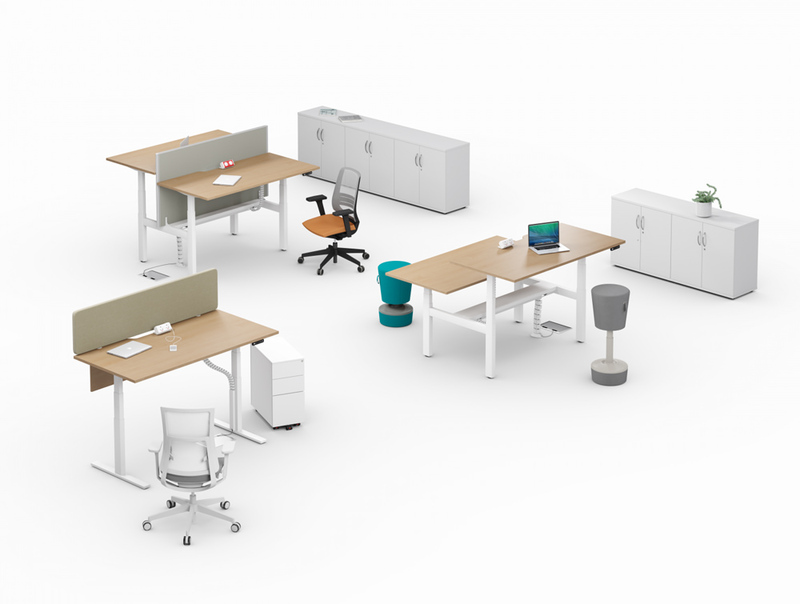 Available in bench desk format, this height adjustable desk system allows a 4 person bench cluster to accommodate 4 different options of desktop adjustment. 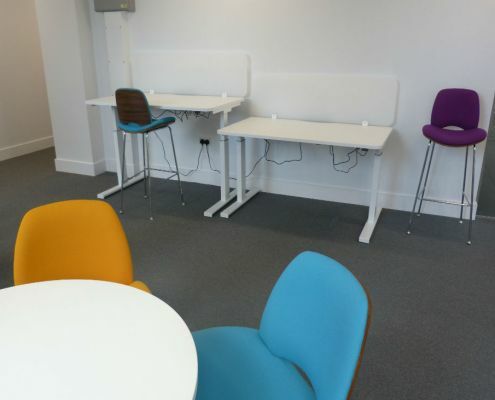 Horizontal cable management on the Freedom desk is facilitated by the use of optional ‘drop down’ cable trays, which can be hinged down on both sides to allow access into the cable trays from the front or rear of the desk. 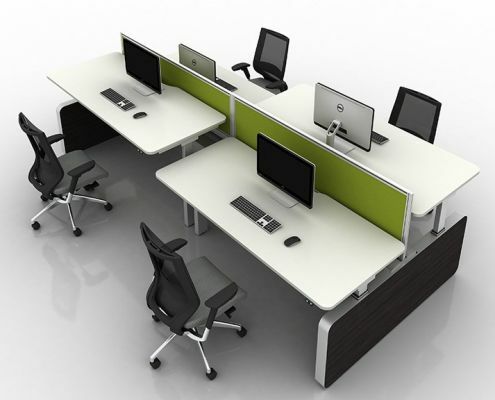 These height adjustable desks come in a wide variety of MFC colour tops. We can also offer these height adjustable desks with a constrasting edge for example grey top and anthracite edge. Finally, the Freedom Lite height adjustable desk system is a new range of electric-only sit/ stand height adjustable desks, available in 600mm deep or 800mm deep. The Freedom Lite is available in a variety of shapes including rectangular, radial and also 2 piece radial which can come in 2 seperate colour finishes. This makes your height adjustable desk stand out from other modern-day offices. We can also provide storage solutions to match the height adjustable desk including pedestals, cupboards, tambours and more. We also offer FREE ergonomic seat assessments! We can come to you or you can come visit our 10,000 sqft showroom and we can advise you on the best chair/ desk set up for you. Ergonomics are often overlooked and can create mass problems for employees – prevent future problems now by taking a read of this handy guide. Sit–stand desks don’t just have long term benefits, as they are also extremely beneficial in the short term for the body. Standing helps prevent a harmful build-up of sugars and fats in your blood, as a result, workers who stand more have better energy levels and concentration. If elevating your workspace and adding some sit-stand desks to your office sounds like it could improve your wellbeing– get in contact so we can advise and design the perfect solution for you. 5 Top Tips: Staying Productive At Work What does your reception area say about your business?